Birthday greetings to Kimberly Willis Holt (My Louisiana Sky, When Zachary Beaver Came to Town). It’s the birth date of Aileen Fisher (1906–2002), The Story of Easter, and Phyllis Whitney (1903–2008) who wrote children’s mysteries from the forties through the seventies. She lived to age 104! Happy birthday to California, which became the 31st U.S. state in 1850. In 1945 the first computer bug is identified. While working on the Mark II Aiken Relay Calculator, a primitive computer at Harvard University, Grace Murray Hopper discovered a moth in the works and wrote in a logbook “first ‘actual’ case of bug being found.” The term and “debug” become part of computer programmers’ language. Chrysanthemum Day (Kiku no Sekku) started in Japan in 910 A.D. Read The Sign of the Chrysanthemum by Katherine Paterson. It’s Wonderful Weirdos Day! The folks in Austin, Texas, created this holiday to celebrate wacky and eclectic people. Try Weirdos from Another Planet, a Calvin and Hobbes book by Bill Watterson, Weird Parents by Audrey Wood, or Weird Friends: Unlikely Allies in the Animal Kingdom by Jose Aruego and Ariane Dewey. Celebrate Teddy Bear Day by rereading Corduroy by Don Freeman. Today we can celebrate Wonderful Weirdos Day, created by the citizens of Austin, Texas. The organizers suggest that we all need to recognize those individuals in our lives who are not normal or average. Our book of the day does just that; even its subtitle suggests that it celebrates a wonderful weirdo as it chronicles the “improbable life” of Paul Erdös. Few write narrative nonfiction with the passion of Deborah Heiligman, author of Charles and Emma. 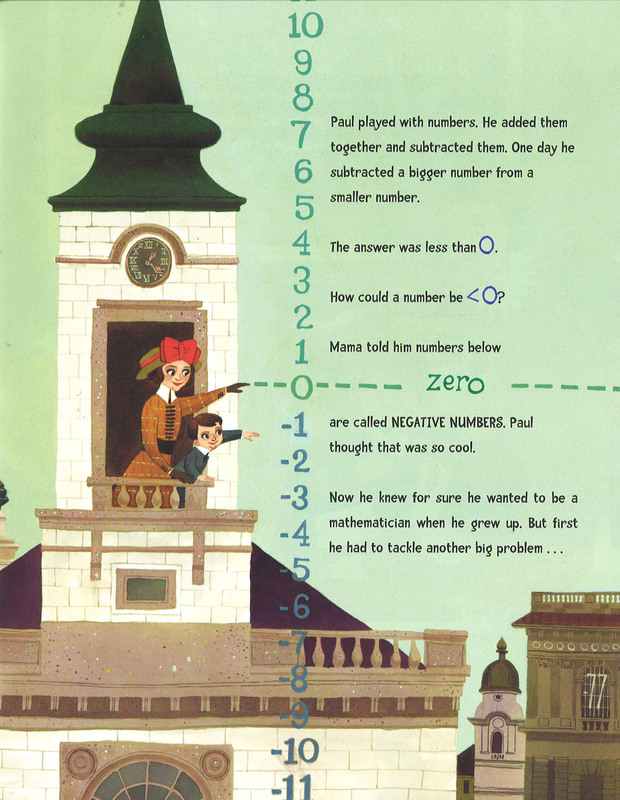 In her new picture book she takes up the cause of presenting the weird, geeky, math-loving genius Paul Erdös. Born in Budapest in 1913, Paul depends on his mother and caretaker to cut his meat and butter his bread. But by the age of four he can tell anyone how many seconds they had been alive when they tell him their age. He plays with numbers—and particularly loves prime numbers. Like many young geniuses, Paul does not exactly fit in at elementary school, so his mother educates him at home. By high school Paul finds other math nuts that share his passion. By the age of twenty, although he lectures around the world, Paul still doesn’t know how to do his laundry or butter his bread. But this does not stop him from traveling globally on behalf of his profession—now his hosts cut his grapefruit and even pay his bills. For a period of time the FBI spies on him. Perhaps they would have learned more if they had been willing to prepare his meals! But nothing deters Paul from working on number theory and set theory. His work paves the way for Internet search engines. In the perfect end to a life devoted to numbers, Paul dies while at a math meeting. Heiligman’s author notes extend her delightful saga of his life. And LeUyen Pham’s artwork brings this wonderful weirdo to life. He jumps and leaps around the pages, with numbers appearing wherever he goes. Pham’s lengthy art notes, all too rare in picture books, extend the text and provide information about her visual interpretation of Erdös’s life. Anyone interested in visual accuracy in picture books should own this book for the footnotes alone! If you are fortunate to have a wonderful weirdo in your life, share The Boy Who Loved Math with them. 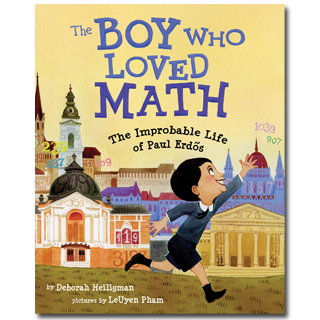 Engaging, exciting, quirky books that encourage the study of math are hard to come by. We can all be grateful to Deborah Heiligman and LeUyen Pham for creating one. And to all the wonderful weirdos who read this column—my love to you. You are the best! Originally posted September 9, 2013. Updated for .